Our group buying adventure led us to The Bungalow restaurant in Corona Del Mar, a revered South OC establishment. 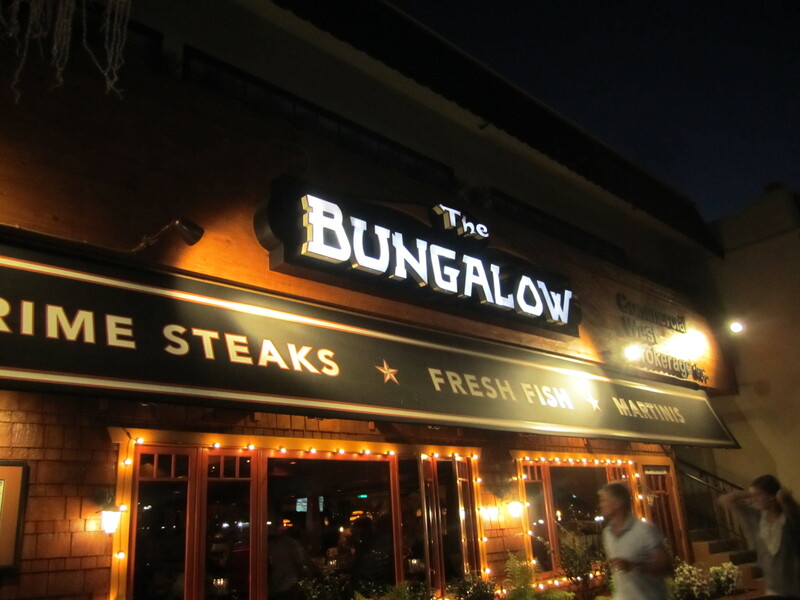 The Bungalow is known for aged prime steaks and a quaint setting on PCH. The entrance of the Bungalow is a dimly lit bar area which is decorated with dark wood and leather. The bar area was obviously the local watering hole, as I noticed many sophisticated ladies giving me the lioness eye as I walked in the door. This front bar area is relatively noisy, as it is packed full of people mingling and socializing over one of the Bungalow’s signature martinis. I did not have the opportunity to order one of their Martini’s, although the word on the street is that they are really amazing in flavor and kick. The restaurant has both a main dining room and a covered patio space. The patio featured an elegant patio cover, fireplace and candles, as well as a cozy outdoor setting. Once we were settled in, the waitress greeted us and guided us through the menu offerings. This restaurant employs a professional wait staff that is well versed on the menu and a variety of cooking techniques. Our drinks and appetizer came out promptly and our water glasses were always full. We were never looking for the waitress, she somehow had E.S.P. and knew when we needed something. We ordered a bottle of wine, a cheese plate, the chef’s special, which consisted of a 22 ounce porterhouse, a 10 ounce filet and the double pork chop. 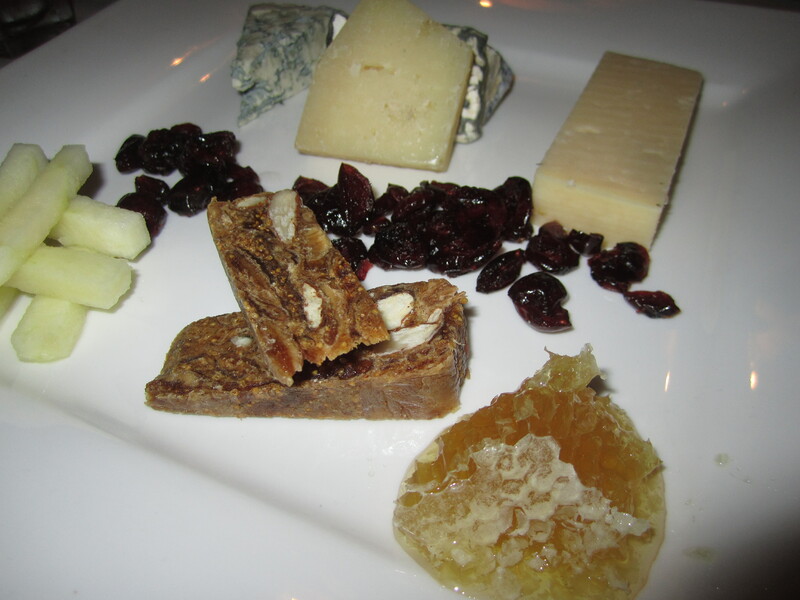 The Cheese Plate – The Cheese plate featured five types of cheeses and five condiments. The cheeses included a cheddar, manchego, brie, camembert, and Humboldt Fog. The sides were pretty amazing in their own right and consisted of unleavened fig bread, oozing honeycomb, dried cranberries, and toasted bread points. All the cheeses were amazing, especially when paired with the sides. The cheese plate was actually one of the high points of the meal and nicely complimented the wine we ordered. 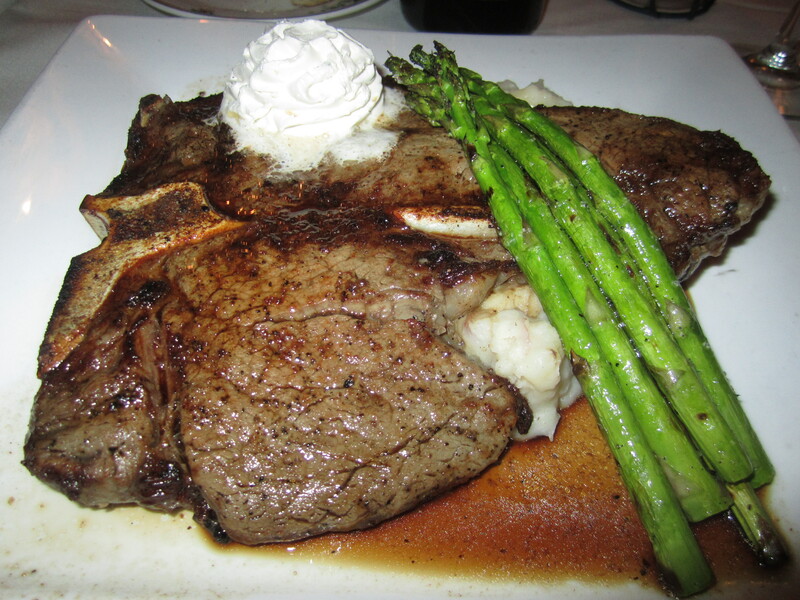 The Porterhouse – This was a 22-oz behemoth of a steak that came with baby asparagus and garlic mashed potatoes. The steak was a little intimidating in size when it arrived at my seat and the waitress joked around that this was the Fred Flintstone Cut and it was suitable for sharing. A porterhouse steak is a composite steak with two different cuts of meat (tenderloin and New York) separated by a T-bone. In fact, the porterhouse is the over-sized brother of the T-Bone, just thicker and has a much larger section of tenderloin. The steak had very nice grill lines across the steak and had a nice color from the char. I started on the tenderloin side of the steak (smaller side) and easily cut my knife through the flesh to reveal that the steak was pink throughout and full of juices, cooked medium per my order. The tenderloin side of the steak was extremely juicy and full of natural prime steak flavors from cooking on the bone, which was an amazing experience. Although, as I cut into the New York side of the porterhouse, the results were disappointing and my plate became the tale of two cities. The New York side was tough to cut with the steak knife and the knife actually became snagged several times as I cut through. I inspected the steak for evidence of being overcooked, but the flesh was nearly pink throughout, but not juicy. As I bit into the steak, I noticed that the meat was stringy and I had to chew through excessive connective tissue. The New York side of the steak was also a lot tougher than similar cuts that I have previously eaten. I wanted to ensure that I was not spoiled and overly critical after eating the tenderloin sides, so I had the other members of my party try the steak. Their reactions to the steak were identical, with reactions like “that’s a little stringy” or “it is a bit tough for a loin cut, there must be something wrong there.” I am not sure if the steak was a bad cut of meat or potentially overcooked, but it was not up to the standards of a restaurant who claims to specialize in aged prime steaks. In addition at a $55 price tag, I was expecting a steak that was tender on both sides of the T-Bone. Based on the composite quality of both sides, I would expect to have paid much less for this porterhouse, perhaps $30-$35. Based on both sides of the steak and the price point, this dish got a 2.5. If I had not eaten the entire tenderloin side first, I would have sent it back to the kitchen. 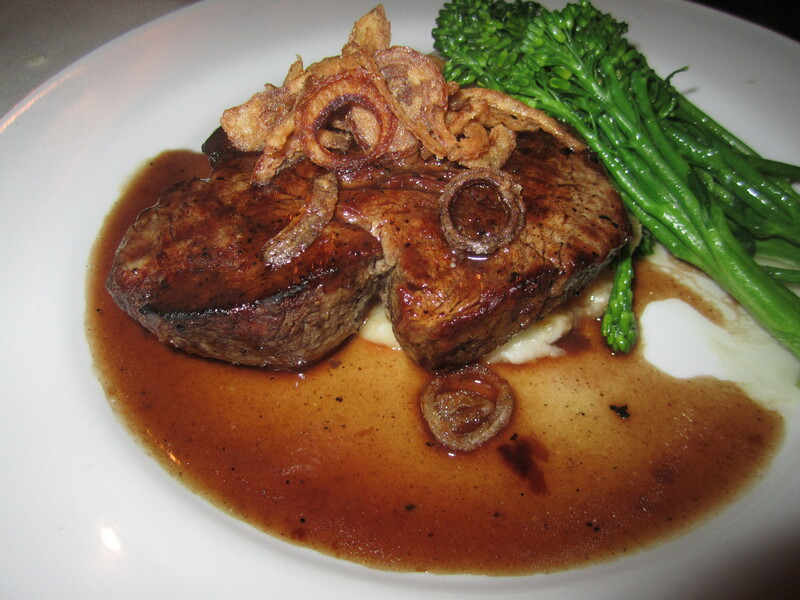 The Filet Mignon – The 10 ounce filet was served with a garlic mashed potatoes and broccolini. The steak had a nice appearance with even char lines and glistening brown color. When the steak was cut open it was pink throughout and slightly runny with juices, and was very nicely cooked a medium rare. This steak had a good natural beef flavor and was for the most part tender and juicy. Daniele indicated that it was a very good steak, although not one of the best filet mignon she had ever tasted. Daniele noted that for the price point, this dish received 4 out of 5. 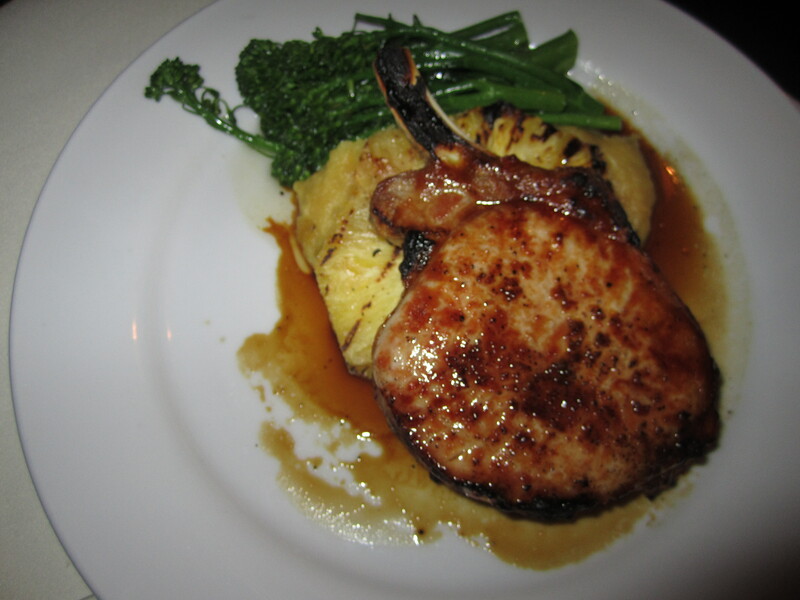 The Double Pork Chop– The double pork chop was served on the bone and served with parsnip mashed potatoes , grilled pineapple and broccolini. Due to the size of the double pork chop, the plating of this dish was impressive. The pork chop had a nice char and caramelization from the sugars used in the marinade. The pork chop rested on a thick cut of grilled pineapple, which added even more sweetness to the pork chop. On the side was a gently cooked serving of broccolini which retained its crunch and bright green color. The pork chop was cooked nicely and was extremely juicy when cut open. Peggy’s main issue with this dish was that the pork chop was too sweet. She indicated that the sweet flavor infused into the pork chop had overpowered her palate, thereby reducing her ability to taste the natural flavors of the pork. This was a shame, especially since pork already has a sweet and savory flavor that should be enjoyed naturally. Peggy gave this dish 3.5 out of 5 because the sweetness was a distraction. This dish should have been 4 out of 5 if it were prepared differently. The Bungalow has it’s share of extremely positive ratings on a variety of websites, such as yelp.com and urbanspoon.com, although my investigation was confirmed by some of the negative reviews read from less than fully satisfied customers. The main issue I have with the Bungalow is their high price point for imperfect dishes. For example, I would not expect to pay $55 for a stringy steak. In addition, the wine we selected from the menu was sold out and we had to pick a wine at a higher price point than we were originally willing to spend. Phenomenal service would have provided us another bottle of wine at the same price point as the one we originally requested. Also the wine list lacked middle tier priced wines. I am usually willing to spend $25-45 on a bottle of wine, although the Bungalow had very few wines within this price range. They only carried $40 wines and above and the $40 bottles were what most restaurants would call their house wines. The Bungalow did many things right including impeccable service, great ambiance, an extensive menu, a great execution of the filet mignon and the cheese plate. Based on our mixed feelings of the overall experience, I am giving The Bungalow an overall score of 3 out of 5. This is not a bad score, although for this caliber of a restaurant a 3 is lackluster and indicates opportunities for improvement. At the price point, I would more likely go to Banderas or Five Crowns just down the street to ensure a quality meal. I am willing to give this restaurant another chance, as it is possible we encountered a series of uncharacteristic issues. I will be posting an addendum to this review when I return. Never tried Kincaids, although next time I see one, I will try it.